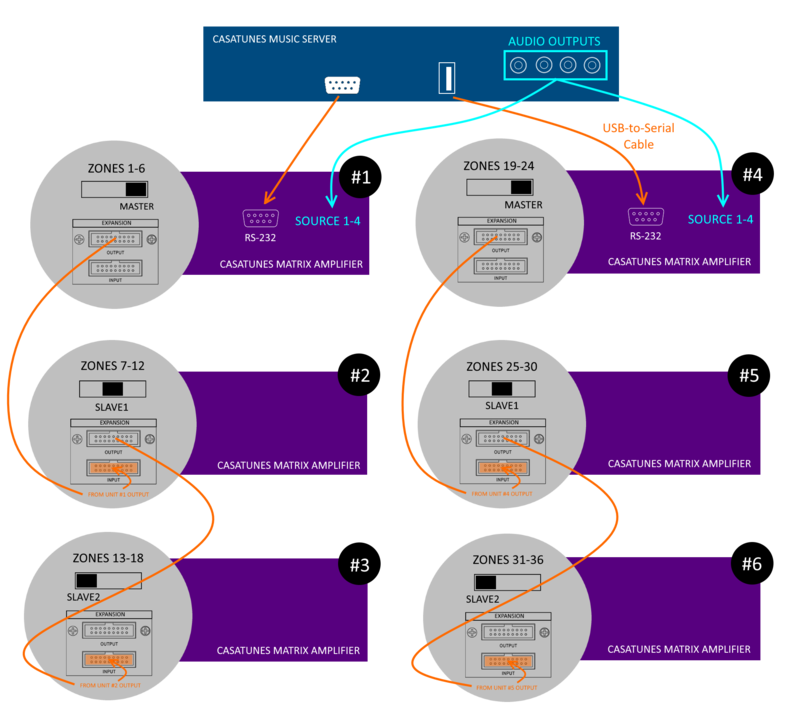 Connect the provided serial cable from the built-in serial port on the music server to the RS-232 port on Unit #1 (CasaTunes 6X6 matrix amplifier). This serial cable is used to control units #1 through #3. The expansion cables used to connect Unit #1 to Unit #2, and Unit #2 to Unit #3 carry the serial cable signals required to control Units #2 & 3. Connect the 4 analog outputs from the CasaTunes Music Server (CT-4) to Unit #1. If you purchased a CT4-24Z, CT4-30Z or CT4-36Z, your music server ships with 4 x 3.5 mm to 2 x stereo RCA cables (Y-cables). Use these to connect the 3.5 mm stereo outputs from the music server to the appropriate SOURCE on both matrix amplifiers (Unit #1 and Unit #4).